The Craniosacral system consists of the membranes and cerebrospinal fluid that surrounds and protects the brain and spinal cord. A light touch is used to detect and clear any restrictions within the system, encouraging your own natural healing mechanism to remove the negative effects stress has had on the central nervous system. 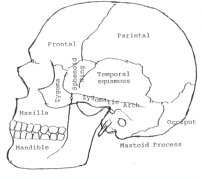 “Abnormalities in the structure or function of any of these systems may influence the craniosacral system. Abnormalities in the structure or function of the craniosacral system will necessarily have profound effects upon the development or function of the nervous system, especially the brain.